(VEN) - Yen Bai Industry Promotion and Development Consultancy Center has built a industry promotion plan in 2015 with total proposed fund of VND4.85 billion, of which the national industry promotion fund is VND2.85 billion and the local industry promotion fund is VND2 billion. 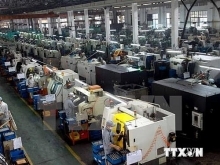 In 2014, VND2.06 billion and VND2 billion have been allocated to the center from the national and local industry promotion funds respectively to support building two projects on applying equipment and machinery in production, two projects on building technical demonstration models and one project on organizing an exhibition of typical industrial products in the northern region. By the end of the first half this year, Yen Bai Province had 20 projects with a total funding worth VND1.378 billion./.